This food and drink itinerary starts in Edinburgh. No trip here is complete without a visit to the Scotch Whisky Experience – home to the world’s largest collection of this amber nectar. The Gold Tour gives the chance to view the collection and to learn about the production of the spirit from the comfort of a whisky barrel ride. All participants will become members of the Scotch Whisky Appreciation Society and, assisted by experienced guides, will compare and contrast four regional single malts whilst relaxing in the beautiful McIntyre Gallery. By the time they leave they will be able to sip like a true connoisseur! For the true whisky enthusiast, the Morning Masterclass allows an extended guided viewing of the whisky collection over coffee and shortbread. A fun sensory perception test then prepares for a comparative tasting of one blend, one single grain and two single malt whiskies, and the nosing of a new-make spirit. Both experiences include a complimentary boxed crystal whisky tasting glass. Profile Located beside Edinburgh Castle, at the top of the historic Royal Mile in the heart of Edinburgh’s Old Town, the award-winning, 5-star Scotch Whisky Experience is one of Scotland’s most prestigious visitor attractions. Translation: Audio guides are available in 20 languages at no extra charge on the Silver and Gold Tour ONLY. These languages are: English, French, German, Italian, Spanish, Portuguese, Dutch, Russian, Swedish, Japanese, Polish, Czech, Hindi, Mandarin, Gaelic, Brazilian Portuguese, Cantonese, Korean, British Sign Language and American Sign Language. All other tours are offered in English only, and no live translation will be permitted. Extra information: Child-friendly exhibits and tailored tours, fully wheelchair accessible. Expert tour guides and whisky advisors are on hand throughout the experience to tailor make your visit and ensure the enjoyment of every member of your party. After a hearty lunch at one of the many fine pubs and restaurants near the Royal Mile, it’s time to explore the city – the easiest and most convenient way being with a City Sightseeing hop-on, hop-off bus tour. Major attractions along the route include Edinburgh Castle, the National Museum of Scotland and the Palace of Holyroodhouse – all brought to life with informative audio guides available in nine different languages, and with a dedicated Horrible Histories commentary for kids. Tickets allow unlimited travel for 24 hours. Private tours: Please contact to arrange. Translation: Available in French, German, Portuguese, Spanish, Italian, Russian, Japanese and Mandarin Chinese. 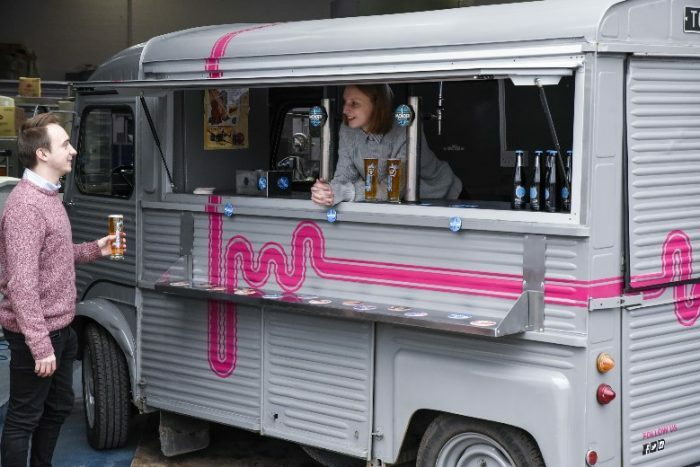 Visitors can hop off the bus at stop 9 and catch the tram out to Bankhead where it will be just a short walk to the Edinburgh Beer Factory, a family owned microbrewery that was founded in 2015. Edinburgh Beer Factory is famous for it’s exciting tours, borne out of a passion for larger and Scotland, and visitors will learn all about the larger-making process, and get the chance to taste the raw ingredients and the unfiltered brew! Profile A family owned microbrewery. Founded in 2015, we seek to reinvent underestimated beer styles, like lager; re-making them in Edinburgh and challenging the stereotypes associated with them. Put simply, we make beer beautiful. We offer brewery tours, tasting events, a gift shop and taproom. Frequency: Friday 6pm, Saturday 2pm. Plus additional tour slots when busy or if privately requested. On the second day, it’s an early start for Glasgow, but not before stopping at one of Scotland’s most iconic sites. Just over an hour’s drive out of Edinburgh, on the way to Glasgow, are the magnificent equine sculptures known as The Kelpies. A half-hour guided walking tour explores the vision of artist Andy Scott and demonstrates how his 30 metre high designs were inspired by the history and industry of the region. *Trade rates available for tours departing before 12 noon. An alternative option is a visit to one of the largest and most impressive castles in Scotland – Stirling Castle – which is just an hour from Edinburgh by train. After storing luggage at the nearby bus station, it’s just a taxi or a 15 minute stroll through the medieval town up to Castle Hill. Most of the principal buildings of the fortress date from the 15th and 16th centuries and, before the union with England, Stirling Castle was a frequently used royal residence. Several Scottish kings and queens were crowned at Stirling, including Mary, Queen of Scots, in 1542. Profile Stirling Castle is one of Scotland's most celebrated visitor attractions. For centuries Scotland's kings and queens held court here and reveled in its beauty and grandeur. Frequency: There are guided tours available. It is advisable to ask on the day the timings of the guided tours. In the afternoon or evening, a guided food walking tour through the historical heart of the city with Eat Walk Glasgow, is a great way to sample food and drink at some of the city’s best restaurants, bars and shops. Participants will also have the chance to learn about the history of the city, meet local people who are passionate about food and drink, and discover interesting city sights and other places to visit when the tour is over. Profile A food walking tour that explores Glasgow city centre visiting five interesting venues for food tastings with three of the stops also having drink tastings. The guide will talk about the history of the city as the group walks between venues. But many of the stops for tastings on this tour are in fantastic buildings with a story to tell in their own right. Tour last 3-3.5 hours and broken up with stops every 15-20 minutes where we have table reservations and toilet facilities are available. We can cater for special dietary requirement with advance notice. Today’s full day VIP food tour is curated by Scotland’s World Food Travel Association Ambassador, Brenda Anderson. This gastronomic and cultural tour includes a VIP insight and tasting of smoked salmon as guests of the Colquhoun Clan at their local smokehouse restaurant on the banks of Loch Lomond. A seafood lunch plucked straight from Scotland’s largest sea loch and a visit to Downton Abbey’s fictional ‘Duneagle Castle’*, is also included. And if that’s not enough, it’s also a great chance to soak up some breathtakingly beautiful Scottish scenery, whilst being entertained with some legendary and hilarious tales of the past! A visit to Tennent’s Training Academy offers a range of options for a visit – from attending one of over 40 cookery classes at Tennent’s Training Academy (scheduled or bespoke), to a brewery tour and tasting at Wellpark Brewery, home of Tennent’s beer. A new tour goes behind the scenes to learn about the rich heritage of one of the country’s most beloved brands, as well as the production processes that have taken place at Wellpark for more than 450 years. For real beer enthusiasts (or keen novices) there is the option of following up the tour with a 2 hour Beer Tasting Masterclass – during which one of the Academy Bar Trainers will take participants on a journey through history as told by the beers, and brewers, of the world. With a laid-back guided tasting, participants can sample and learn more about a range of different beer styles, their flavours, food pairings, and the history behind the pint. In the evening your clients will say goodbye to Glasgow and catch the train to Fort William. Fort William is situated in the Western Highlands. Known as the ‘Outdoor Capital of the UK’, it is a haven for hiking and climbing, primarily due to its proximity to Britain’s highest peak: Ben Nevis. It is also one end of both the West Highland Way (Milngavie to Fort William) and the Great Glen Way (a walk/cycle way between Fort William and Inverness). The town has many fine pubs serving local ale and whisky, and great seafood can be found down by the ferry landing. Fort William is also the starting point of the ‘World’s Greatest Railway Journey’ – Fort William to Mallaig – a route that traverses the Glenfinnan Viaduct and is now recognised the world over thanks to the Harry Potter films. Riding on the famous Jacobite Steam Train is a great way to enjoy this beautiful journey. On reaching Mallaig, it is possible to continue the adventure by getting a ferry across to the Isle of Skye, or by taking the train back to Fort William.